These days, it’s almost more confusing when Tim Lincecum succeeds than when he screws up. If there’s one thing we’ve learned by watching Barry Zito’s ascent to mediocrity these past couple of years it’s that when Zito’s breaking pitches are working, even a lineup of the best and brightest can’t catch up to an 84 mph. If Zito can establish the ridiculous curveball and surprisingly deceptive cutter, even his modest “fast”ball can work be incredibly effective as Zito pitches “backwards,” leading with breaking balls and following up with heat. The problem with Lincecum seems to be that he’s still trying to pitch forward, starting with heat in the zone and finishing with sliders and changeups in the dirt. This means that he has to lead off at-bats by throwing fastballs over the plate. When he was doing that in 2008 and winning Cy Youngs, he was averaging 94 mph. Tonight, averaging 90 mph, those pitches are way too hittable. But velocity isn’t the whole story, because we’ve seen him equally terrible when throwing hard. It’s just that a slower fastball with terrible location is much easier to hit than a faster fastball with terrible location. 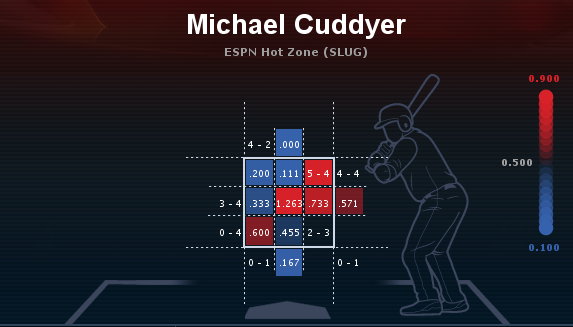 Now let’s look at Cuddyer’s heat map in 2013. 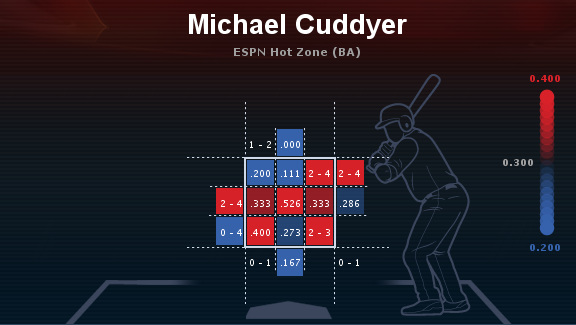 Turns out he hits pitches low and on the corner pretty well. I imagine it’s even easier at 90 mph. Yep. Turns out he hits pitches right down the middle pretty well.